Although the Bible contains sixty-six books, written by forty authors, it is one book written by one author, the Holy Spirit, with one subject: Jesus Christ. How do these books, from Genesis to Revelation, fit together? The Story of Scripture guides the reader through the four major themes of the Bible-Creation, Fall, Redemption, New Creation-showing how each individual book of the Bible tells a cohesive story centered on Jesus. 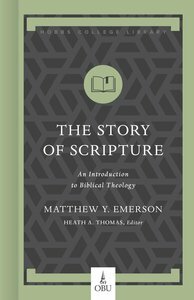 About "The Story of Scripture: An Introduction to Biblical Theology"
Matthew Emerson (PhD, Southeastern Baptist Seminary, ) is Dickinson Assistant Professor of Religion at Oklahoma Baptist University in Shawnee. In addition to a number of articles, he is the author of Christ and the New Creation: A Canonical Approach to the Theology of the New Testament (Wipf And Stock, 2013). Emerson also serves as a steering committee member for the Scripture and Hermeneutics Seminar and Senior Fellow for the Center for Ancient Christian Studies. chapter 1: What Is Biblical Theology?